Safe PST Backup – a free tool to auto backup Outlook PST files. Personal Backup Outlook software. 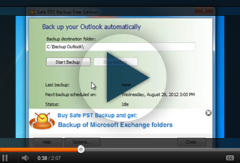 Backup Exchange folders* and PST files using Safe PST Backup. Back up Email, Contacts, Calendars or other folders. Create Microsoft Outlook PST backup email archive automatically. Free backup tool for Microsoft Outlook back up using the native PST file format. Backup email, contacts, calendar, tasks and other folders to native Microsoft Outlook PST file format ensures that it is compatible with any Outlook version and can be used by other applications compatible with the PST format. Microsoft Outlook back up folders to the local disk or Network location automatically. Safe PST Backup is a freeware software (free to run and distribute the software without modification and without restrictions). Back up Outlook PST files with or without Microsoft Outlook running. Most of our competitors' software is backing up Outlook by simply copying PST files or making their shadow copies. If Outlook is open this leads to many problems. PST files are copied without the latest changes because Outlook is locking up the PST file or the backup software utility is waiting for Outlook to close. Shadow copies of backed up PST files include information that has been saved after the latest close of Outlook only. Safe PST Backup uses sophisticated technology to access Outlook items directly and backs up the latest changes even if Outlook is open and you are working on it. Incremental Outlook backup model. Email archiving. Fast incremental Outlook backup. Safe PST Backup software will back up only changes made to your Outlook items to reduce the backup size, transfer time and network traffic load. Email archiving has never been easier. Complete background PST file backup solution. Backup process starts and will run automatically without interfering with your work even if Outlook is open. Manual or automatic scheduled PST backup modes. Schedule PST backup or start Microsoft Outlook backup manually on Windows PCs. Automatically back up a .pst file to a network, local, external drive, or memory device. Select Microsoft Outlook PST files to back up. In case if you have several Microsoft Outlook PST files in your default Outlook profile, you can select which one to back up to preserve the hard disk space and archive only the ones you need. Selection of Outlook folders to back up in Enterprise Edition. Select the folders you specifically need to back up from every Outlook storage (PST) file. Available in Enterprise Edition. Backup PST files securely with a password. Safe PST Backup software utility will backup Outlook PST files securely with a password. Schedule and save history backups in Enterprise Edition. Set up an additional schedule to create history backups which will keep copies of previous backup files. Saving history backups, or full backups, is possible only in the Enterprise Edition of Safe PST Backup. Backup retention options for history backups in Enterprise Edition. Set up how many previous backup copies to keep and how much disk space all backup files should use when scheduling history backups. Full backups and backup retention options are available only in the Enterprise Edition of Safe PST Backup. Option to suspend scheduled backups. Scheduled backups can now be suspended from the right-click menu of the icon in the system notification area. Suspend any scheduled backup easily if the timing isn't right for you. Restore to any Outlook version using native Outlook PST file format. Safe PST Backup is using the native Outlook PST file format which allows importing the backup to any of Microsoft Outlook versions or using it within other applications. It is fully compatible with existing corporate file software backup and restore solutions. Safe PST Backup software will back up all the latest changes (including deletions) made in your Outlook. Use standard auto backup solution (Shadow Copy, integrated Windows Backup or Windows System Restore) to save several versions of Outlook PST files backed up with Safe PST Outlook Backup program. Compatible with the latest Windows and Microsoft Outlook versions. Safe PST backup is compatible with Windows XP, Vista, Windows 7 32 and 64 bit, Windows 8 32 and 64 bit and Windows 10. Compatible with Outlook 2019 64-bit and 32 bit, 2016 64-bit and 32 bit, Outlook 2013 64-bit and 32 bit, Outlook 2010 64-bit and 32 bit, Outlook 2007, Outlook 2003 and 2002. Open and read .ost orphaned files of any size created by any version of Microsoft Outlook. Open multiple OST files, search and copy or export any data from OST files. Use Free PST file Viewer to open, view and search in PST files without Microsoft Outlook and importing. View content of multiple healthy, damaged or corrupted PST files. Open and view PST file content such as messages, contacts, calendars and notes in any folder. PST Mover Migrate emails, contacts and calendar to Office 365. Move PST file to new: Outlook, Exchange or Outlook 365. Why Safe PST Backup Enterprise? I'm having a hard time understanding why Safe PST Backup is not yet installed on every PC in the entire world. It's affordable, the support is outstanding and it really does work!"